Yikes! Can you believe I forgot to post this before the opening!!!????!!!! Too busy! Next week I’m going to try and write up the difficulties I had getting this show together because the list is so long it became absurd. The show looks really good though so I’m really happy. I will also post some video of the show for those who can’t make it. 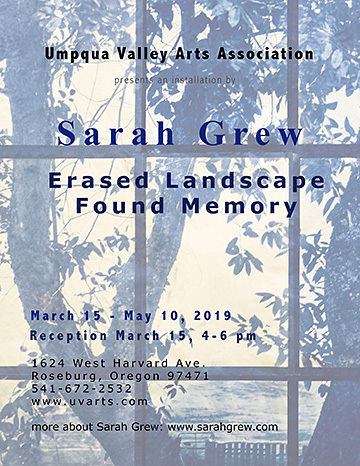 I’m really excited to announce my upcoming show at the Umpqua Valley Art Center in Roseburg opening in March. I’m going to turn the space into a blue room of images of Oregon, past and present. My cyanotypes are going to go into the windows of the room. I’ve been doing tests with various Japanese papers to find one that works well with cyanotype. The room is HUGE with 10 windows that are 4 feet wind and 7 feet tall!!! 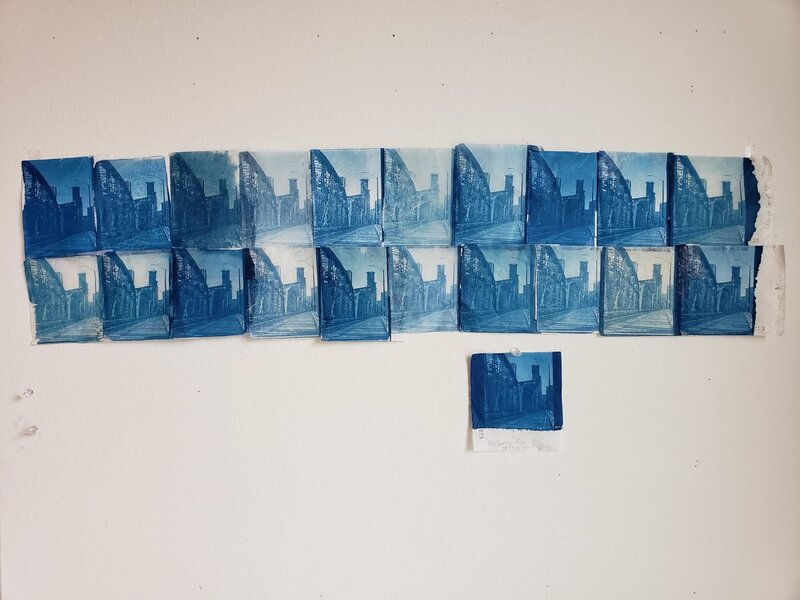 Here are 21 successful 4” x 5” tests, first on the wall and then in the window of my studio. Of course being able to create a 4” x 5” image doesn’t mean the paper is easy to work with when wet once it is 16” x 20”…. A few notes about the process - I used the same negative and exposure time for each test using an exposure unit I built. Cyanotypes are slow compared to some of the UV light sensitive printing methods. Each exposure took 20 mins. So happy to be so busy creating! More soon! 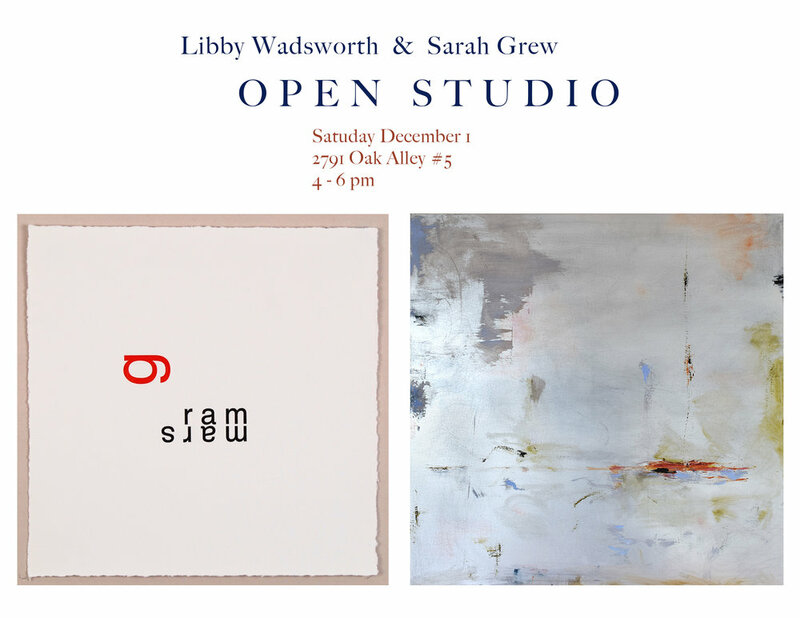 Finally, Libby and I are doing another Open Studio, so come on down on December 1 from 4 to 6 pm. We look forward to seeing you in the studio! Earlier this year my work was included in Views From Oregon: Sixteen Artists. The show was a celebration of the collaboration between the Ucross Foundation and the Ford Family Foundation which helps foster opportunities for many Oregon artists and led to an exhibition catalog being produced. I just discovered that the catalog of the artists who have received fellowships from the Ford Family Foundation for residencies at either Ucross Foundation or Djerassi Resident Artist Program can be seen online here. Somehow the photo of me in the catalog is from my time at Djerassi although my statement and art images are from my time at Ucross. Both were amazing opportunities to work and connect with other artists. Please join me on May 20th for an Open Studio with Libby Wadsworth. 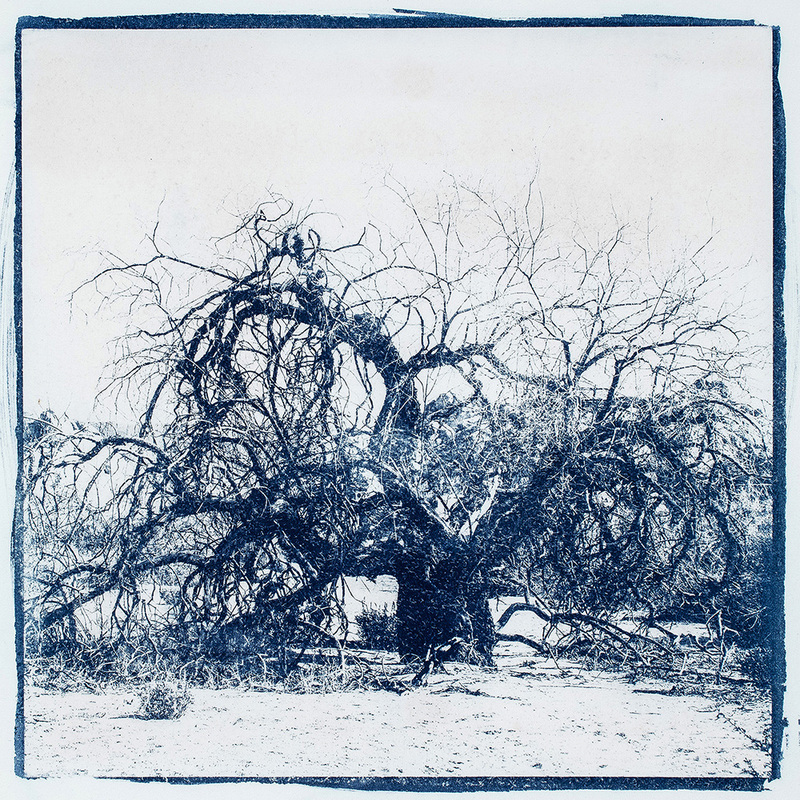 I will be exhibiting some of the cyanotypes I did while the Artist in Residence for Joshua Tree National Park. The palimpsestic paintings that started as Cyanotypes and Van Dyke Brown Types I did while in residence at the Djerassi Resident Artist Program and in the hall I will have some photographs I took while at my Italian residency at the Collegium Phaenomenologicum last summer. As part of their continuing partnership with The Ford Family Foundation the Ucross Foundation Art Gallery is presenting an exhibition called Views From Oregon:16 Artists. The exhibition features the 16 Oregon artists who have been awarded Ford Family Foundation Fellowships to support their residencies at Ucross Foundation Artist in Residence. I was the first of the 16 to arrive close to 4 years ago. My residency time grew my work in so many ways, I feel very thankful for the opportunity to have been there and am thrilled to have my work in the gallery. 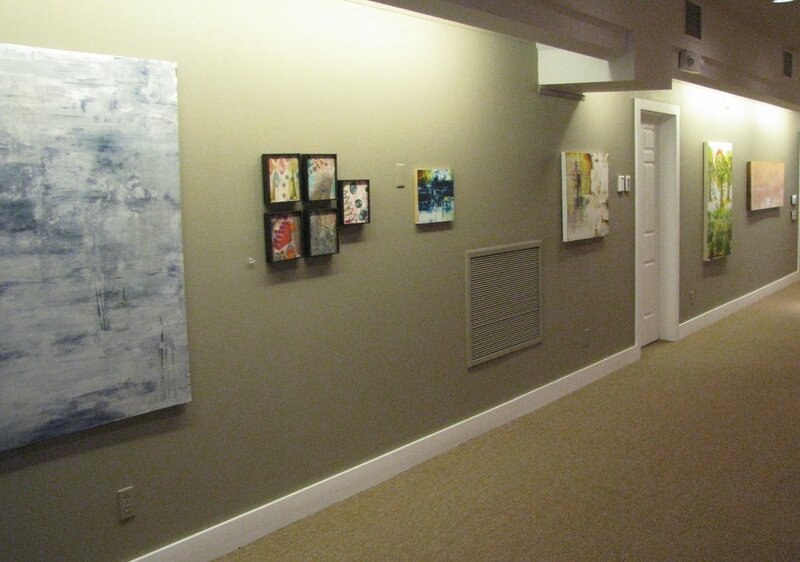 The show opens February 6 and is up until May 12th with an opening on April 22.